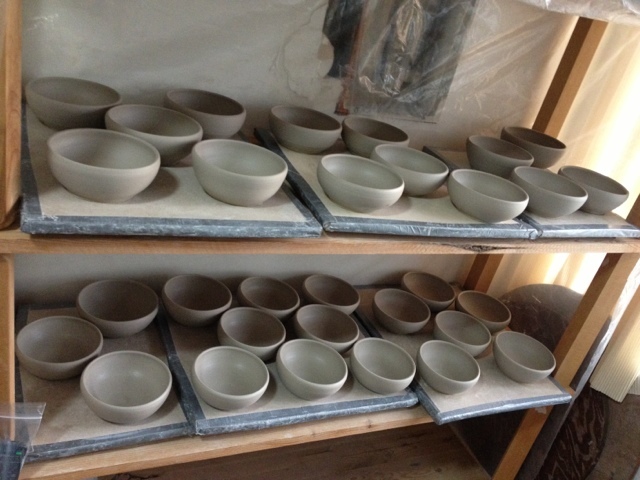 The dry ware shelves are full. 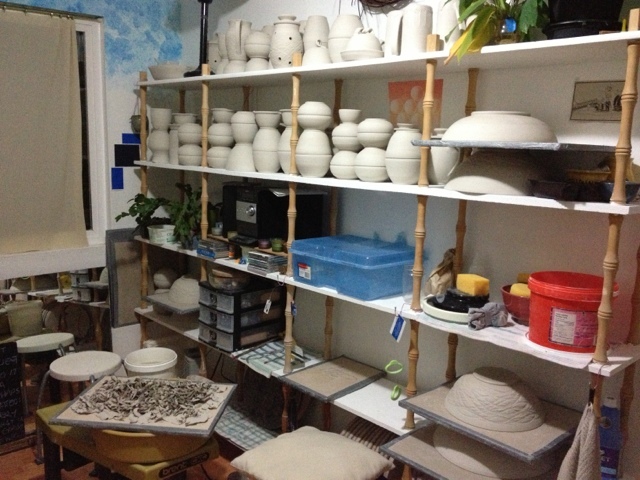 The glazed/unfired shelves are full and the damp cupboard is full. 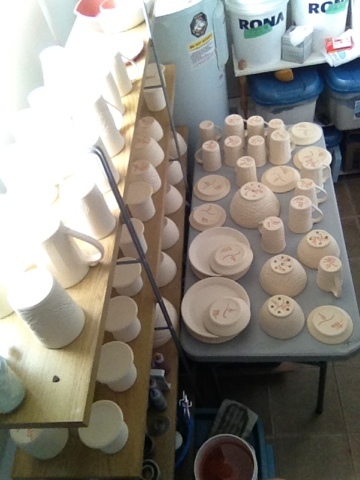 I am not able to load the big kiln shelves into the kiln anymore, as my belly is far too big to reach around so this means that I am having to ask for help...which I am not happy doing. I load all the pots onto the bottom shelf and then go upstairs to ask helper Dave to pick up and lower the very heavy, large shelf into place. Then repeat for the rest of the kiln until we are full and Dave is tired of being the pottery assistant. One of the beautiful things about my tiny studios is that I HAVE to empty one area to move forward in the process, this keeps me moving through the stages that I enjoy less and breaks up the resistance I may be harbouring towards the less pleasing tasks. There is always a certain satisfaction in finishing waxing an entire batch of pots or in unloading, pricing and then putting away 50 fresh pots and seeing the gallery fill back up. I am assuming that there will be little work time after the baby gets here and am filling this last month of gestation with throwing outstanding orders and work for the only show I am doing this season. It is quite a gamble to put all of my (pottery) "eggs" in one basket but I don't really have a choice. On the other hand, show fees are often outrageous and by not doing them I save that money. Always a gamble, this show season may seem less risky than the past six years of a large show each weekend! I will certainly not miss the thirty to forty plus hours in three or four days, that each show consumes or the endless packing and unpacking of pots into and out of tubs, cars and shows. Time will tell how this time of physical limits, limited exposure to the Xmas season circuit and limited income will play out for next year. As long as I learn something, all is well.